The largest MPAs, updated March 2016. The Hawaii reserve is now four times larger. The seas around Hawaii are set to become the world’s largest marine protected area, US president Barack Obama has announced. 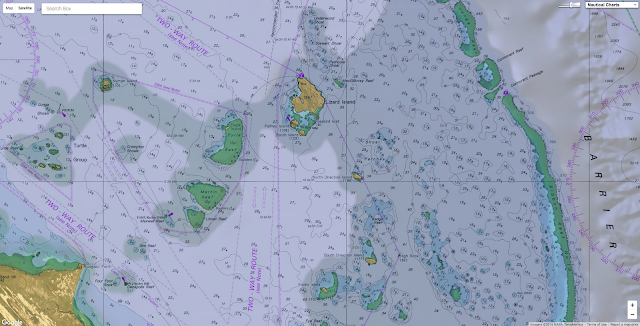 Marine protected areas in the US Pacific EEZ. The Papahānaumokuākea Marine National Monument will be expanded to more than 1.5m square kilometres – that’s as big as France, Spain and Germany combined. If this story sounds familiar that’s because it is. Last year, the UK created the previous world’s largest continuous marine reserve around the Pitcairn Islands, and it set up another huge protected area around Ascension Island in January 2016. Chile, France and New Zealand have all made similar moves in the past few years, turning the waters surrounding their most remote island territories (such as Easter Island) into huge nature reserves. Supporters say these marine protected areas, known as MPAs, have a key role to play in marine conservation as they protect from fishing, mining, drilling or other human activities, and allow habitats and species to be restored. Yet these protections might be undermining the very aims of global marine conservation targets. As we argue in a viewpoint published in the journal Marine Policy, it’s not enough to simply cover the remotest parts of our oceans in notional “protection” – we need to focus on seas closer to shore, where most of the fishing and drilling actually happens. Tracking marine protection declarations globally. April 2016. Under the UN’s Convention on Biological Diversity, signed by almost every country in the world, one of the agreed targets is to designate 10% of the area of the world’s oceans as MPA by 2020. We are a long way from this, however, with less than 4% of the global marine area currently protected. Even this is largely thanks to vast remote MPAs in distant seas that are subject to few human pressures. While there are more than 6,000 MPAs in total, the majority (62%) of the global coverage is down to just 24 huge areas. 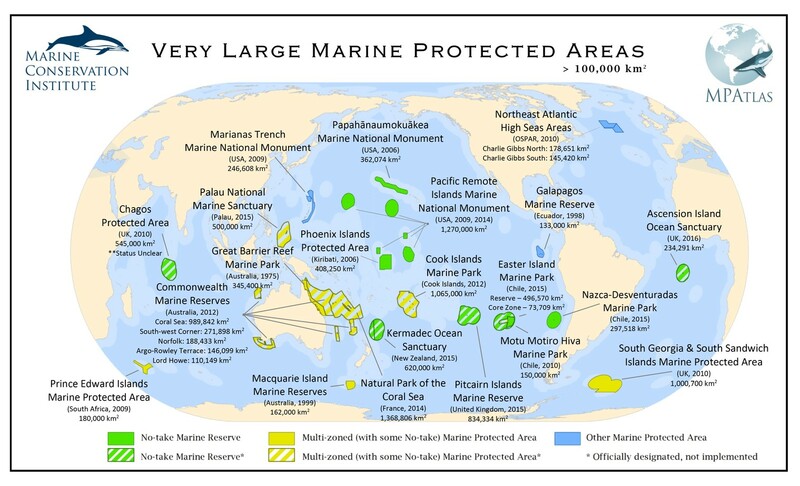 Simple version of global MPA map. April 2016. Recent proposals to increase the MPA target to 30% of the world’s seas, to be discussed at the World Conservation Congress beginning on September 1, can arguably only be met through an increasing focus on the designation of vast remote MPAs. From the perspective of national governments, Hawaii, Ascension and similar protected areas are an easy win. Leaders gain some green credentials while making progress towards their country’s individual MPA target, and all for minimal political cost. After all, these vast protected areas tend to be in overseas territories without much commercial use. Given this easy option is available, why go through the politically and economically expensive process of creating smaller protected areas closer to the mainland? However, as we discuss in our paper, there are concerns that marine conservation aims could be undermined by this focus on a few big areas. The marine biodiversity target is about much more than the proportion of the seas that are covered. It also states, for instance, that the networks of MPAs must be effective, meaning restrictions on fishing, mining and so on are actually enforced. But how do you properly police a patch of ocean almost as big as the state of Alaska? The very vastness and isolation of these protected zones around Pacific or Atlantic islands means they are extremely expensive to patrol. True, emerging satellite technology can provide remote surveillance of fishing vessels. But gaining sufficient evidence for prosecutions and stiff penalties remains a challenge, despite a recent agreement between governments to detain illegal fishing vessels and block their access to markets. The biodiversity target also specifies that the MPA networks must be representative, in that they should protect typical examples of habitats and species in each of the world’s 232 ecoregions, and well connected, in that ecological processes such as fish migrations and larval dispersal should be able to bridge the gaps between protected areas. These elements of the targets can arguably only be met through a more even spread of protected areas, including smaller designations in more intensively used “metropolitan seas” closer to towns and cities. Often, this will include zones where some fishing and extraction is allowed. In the Isla Natividad MPA in Baja California, sustainable levels of abalone (sea snail) fishing is allowed while certain “no-take zones” restore the marine ecosystem. Similarly, the Tubbataha MPA in the Philippines provides for both the restoration of coral reefs and sustainable dive tourism. In both these MPAs, fishermen can benefit when fish and their larvae swim or drift out from these restored areas into fished areas. Marine reserves in busier waters are more challenging, but recent studies indicate their effectiveness is feasible. Last, but certainly not least, MPA networks must be equitably managed, and it’s not clear whether these huge areas fit the bill. Closing the entirety of the seas around remote islands could unfairly impact the few local people who rely on the sea for food and income. An over-reliance on vast remote protected areas could undermine other elements of the 10% MPA target such as their requirements to be effective, representative, connected and equitable. We’ll need lots of different types of marine protection in order to actually achieve these conservation aims. The race towards vast remote MPAs should not divert attention, resources and political will away from the need for smaller protected areas closer to home. North-westerly view of the Bligh Reef area off Cape York. Depths are coloured red (shallow) to blue (deep), over a depth range of about 50 metres. 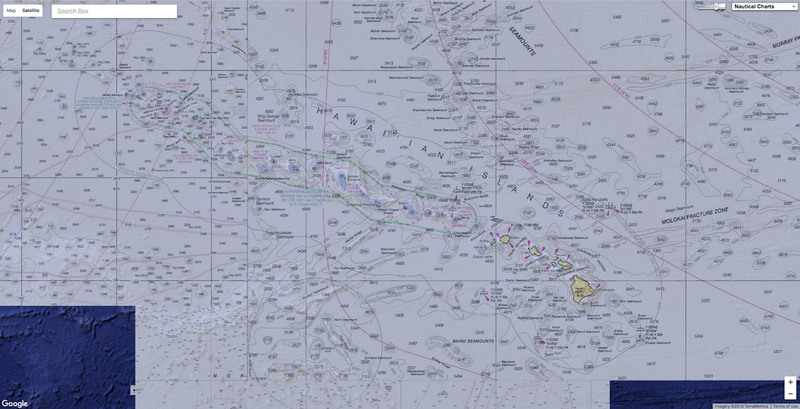 Bathymetry data : Australian Hydrographic Service. 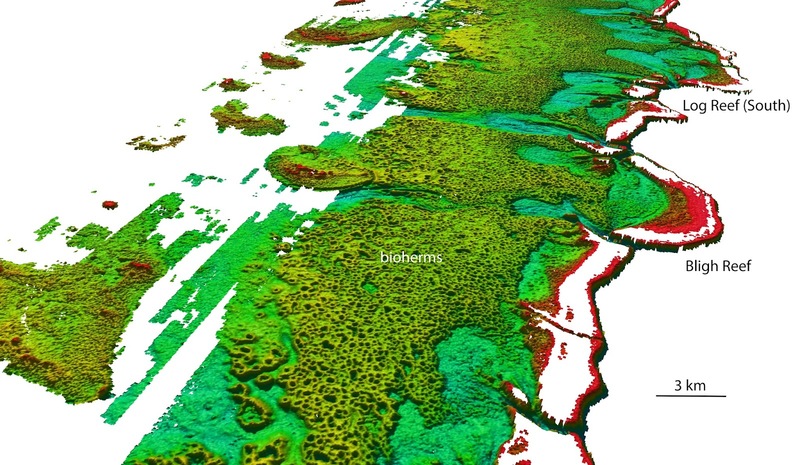 James Cook University, University of Sydney and Queensland University of Technology scientists working with laser data from the Royal Australian Navy have discovered a vast reef behind the familiar Great Barrier Reef. This Envisat image features one of the natural wonders of the world – the Great Barrier Reef in the Coral Sea off the east coast of Queensland, Australia. Australian researchers have discovered that Envisat's Medium Resolution Imaging Spectrometer (MERIS) sensor can detect coral bleaching down to 10 m deep. This means Envisat could potentially map coral bleaching on a global scale. MERIS acquired this image on 18 May 2008, working in Full Resolution mode to yield a spatial resolution of 300 m.
JCU’s Dr. Robin Beaman says the high-resolution seafloor data provided by LiDAR-equipped aircraft have revealed great fields of unusual donut-shaped circular mounds, each 200-300 meters across and up to 10 meters deep at the centre. “We’ve known about these geological structures in the northern Great Barrier Reef since the 1970s and 80s, but never before has the true nature of their shape, size and vast scale been revealed,” he said. Dr. Beaman said it was an astounding revelation. North-westerly view of the Ribbon Reef No. 10 area off Cooktown. Laser Airborne Depth Sounder (LADS) uses red and green LiDAR technology to rapidly scan the seafloor to depths of about 50 meters, generating a dense grid of depth data points. 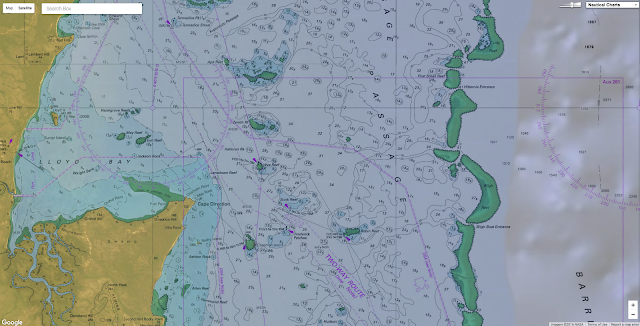 The bathymetry data are then used by the Australian Hydrographic Service (AHS) to revise the nautical charts used by mariners. The Weapons Research Establishment first developed LADS airborne LiDAR bathymetry in Australia in 1972. The navy LADS Flight unit is based out of Cairns for year-round surveying of Australia’s shallow waters. Marine geologists previously understood the bioherms to form linear, dune-like parallel ridges and troughs, quite different to the complex seafloor now revealed with the benefit of LiDAR and multibeam swath bathymetry data collected in the past few years. Less than 15% of the Earth’s oceans deeper than about 200 metres have been mapped using modern surveying techniques. Multibeam sonar flythrough of the submarine canyons along the GBR margin. These canyons drop over 2000 metres from the continental shelf into adjacent basin. The fields of circular donut-shaped rings are Halimeda bioherms, large reef-like geological structures formed by the growth of Halimeda, a common green algae composed of living calcified segments. These form small limestone flakes on death, looking much like white cornflakes. Over time these flakes build up into large reef-like mounds, or bioherms. Mardi McNeil from Queensland University of Technology and lead author on the new research paper, said their extent is vast. Associate Professor Jody Webster from the University of Sydney, said the revelations about the extent of the bioherm field make questions over its vulnerability to climate change even more pressing. The movie shows the operator of the Laser Airborne Depth Sounder (LADS) system and the aircraft shadow while flying at 1200 feet and scanning a laser beam at the seabed. 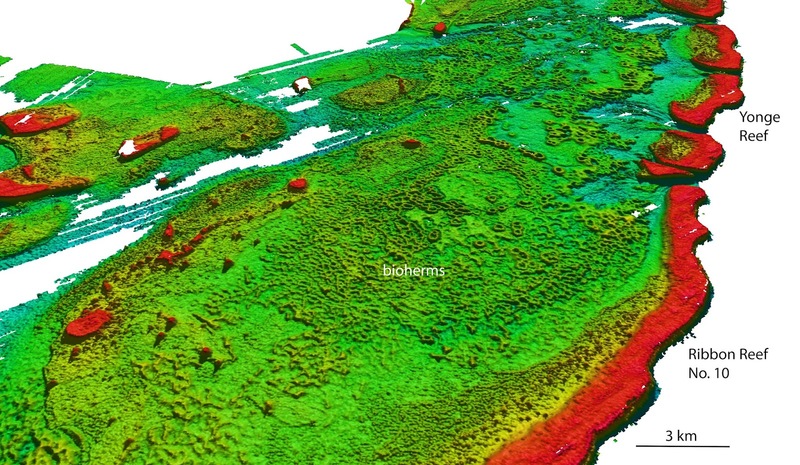 The mapping technique results in dense depth data to about 60 metres depth. Dr. Beaman said the discovery also opened up many other new avenues of research. He said future research would require sediment coring, sub-surface geophysical surveys, and employing autonomous underwater vehicle technologies to unravel the physical, chemical and biological processes of the structures. It looks like a frame from Van Gogh’s Starry Night, but this enhanced image taken by NASA’s Operational Land Imager (OLI) in August actually reveals a bloom of cyanobacteria swirling in the Baltic Sea. Toxic algae blooms, perhaps accelerated by ocean warming and other climate shifts, are spreading, poisoning marine life and people. When sea lions suffered seizures and birds and porpoises started dying on the California coast last year, scientists weren't entirely surprised. Toxic algae is known to harm marine mammals. But when researchers found enormous amounts of toxin in a pelican that had been slurping anchovies, they decided to sample fresh-caught fish. To their surprise, they found toxins at such dangerous levels in anchovy meat that the state urged people to immediately stop eating them. The algae bloom that blanketed the West Coast in 2015 was the most toxic one ever recorded in that region. But from the fjords of South America to the waters of the Arabian Sea, harmful blooms, perhaps accelerated by ocean warming and other shifts linked to climate change, are wreaking more havoc on ocean life and people. And many scientists project they will get worse. "What emerged from last year's event is just how little we really know about what these things can do," says Raphael Kudela, a toxic algae expert at the University of California, Santa Cruz. It's been understood for decades, for example, that nutrients, such as fertilizer and livestock waste that flush off farms and into the Mississippi River, can fuel harmful blooms in the ocean, driving low-oxygen dead zones like the one in the Gulf of Mexico. Such events have been on the rise around the world, as population centers boom and more nitrogen and other waste washes out to sea. Some scientists suspect melting Himalayan ice from climate change is changing rain patterns enough to help reduce oxygen in the Arabian Sea, leading to massive green blooms of Noctiluca scintillans, a harmful algae that is threatening to transform the region's marine food web. "There's no question that we are seeing more harmful blooms in more places, that they are lasting longer, and we're seeing new species in different areas," says Pat Glibert, a phytoplankton expert at the University of Maryland. But scientists also now see troubling evidence of harmful algae in places nearly devoid of people. They're seeing blooms last longer and spread wider and become more toxic simply when waters warm. And some are finding that even in places overburdened by poor waste management, climate-related shifts in weather may already be exacerbating problems. Fish kills stemming from harmful algal blooms are on the rise off the coast of Oman. Earlier this year, algae blooms suffocated millions of salmon in South America, enough to fill 14 Olympic swimming pools. Another bloom is a suspect in the death last year of more than 300 sei whales in Chile. In the north, blooms are on the rise in places like Greenland, where some scientists suspect the shift is actually melting ice. Just this year, scientists showed that domoic acid from toxic algae was showing up in walrus, bowhead whales, beluga, and fur seals in Alaska's Arctic, where such algae species weren't believed to be common. "We expect to see conditions that are conducive for harmful algal blooms to happen more and more often," says Mark Wells, with the University of Maine. "We've got some pretty good ideas about what will happen, but there will be surprises, and those surprises can be quite radical." Kathi Lefebvre, a toxic algae expert with the National Oceanic and Atmospheric Administration, collects krill that died en masse along a beach near Homer, Alaska. Tests later showed the dead zooplankton were loaded with toxins associated with a harmful algal blooms. If you look at seawater under a microscope, what you see may resemble a weird alphabet soup: tiny photosynthetic organisms that can resemble stacks of slender Lincoln logs, stubby mushrooms, balloons, segmented worms, or mini wagon wheels. Some float about in currents; others propel themselves through the water column. As conditions change, the environment can become perfect for one or two to take over. Suddenly these algae may bloom. "Every organism on this planet has its ideal temperature," says Chris Gobler, a professor at Stony Brook University "In a given water body, as it gets warmer, that's going to favor the growth of some over others, and in some cases the harmful ones will do better." Algae is essential for life, but some species and some blooms can trigger serious harm. Some poison the air people breathe or change the color of the sea. Some accumulate in fish and shellfish, causing seizures, stomach illnesses, even death for the birds, marine mammals, and humans that eat them. Some blooms are so thick that when they finally die they use up oxygen needed by other animals, and leave rafts of dead eels, fish, and crabs in their wake. In 2015, as a blob of warm water along the U.S. West Coast was breaking temperature records, regular sampling showed that dangerous levels of the biotoxin domoic acid from the algae Pseudo-nitzschia was building up in shellfish. Short-term harvest closures for razor clams and crab aren't uncommon because while domoic acid doesn't hurt shellfish, it can cause seizures and death in people who eat infected creatures. While scientists knew domoic acid accumulates in the head and guts of fish—which are often consumed whole by marine mammals and birds—researchers rarely find these water-soluble toxins in the parts of fish that humans eat. And where most blooms last for weeks, this one dragged on for months. And while most are localized, this one covered vast areas of sea from Santa Barbara to Alaska. So when Kudela and his crew started testing, they found trace amounts of the toxin in the meat of rockfish, halibut, lingcod, and nearly every fish they tested. "Before, even when the fish were toxic, they (regulators) were saying 'Decapitate it and gut it and it will be fine,' " Kudela says. "It definitely raises new questions, like 'Should we be monitoring things like flatfish on a more routine basis? and 'Are we really prepared for what's coming?' "
The algae Pseudo-nitzschia, which produces the toxic domoic acid, was collected along the U.S.
West Coast in 2015 during the largest, longest-lasting and most toxic algal bloom on record. Domoic acid can cause seizures, other neurological problems and even death in birds, marine mammals and humans. While the heat that drove this massive bloom may or may not be linked to climate change, scientists say a warming climate will make marine heat waves more common in the future. And climate change isn’t just about temperature. It will also change how storms and melting ice add moisture to the marine world, make the oceans more corrosive, and alter the mixing of deep cold waters with light-filled seas at the surface. All of that can and will affect how harmful algae grow. It’s just not always easy to see how. Joaquim Goes, a research professor at Columbia University's Lamont Doherty Earth Observatory has been trying to track climate’s role in transforming one of the world’s rapidly changing marine environments, the Arabian Sea. In the early 2000s, scientists documented blooms of shimmering bioluminescent Noctiluca scintillans, a beautiful green algae that can make the sea light up and sparkle. Now it shows up every year, in ever larger densities and covering more area. "Globally, I've studied lots of ocean basins, and here the change is just massive—this one species is just taking over," Goes says. While it's clear that rising use of fertilizers and massive population growth without corresponding wastewater treatment in places like Mumbai and Karachi are helping fuel this massive change, Goes and some others think that is not the only factor. Rapid melt of Himalayan glaciers is altering monsoon patterns, he says, intensifying them and helping reduce oxygen levels in surface waters, making them more conducive to Noctiluca. That, in turn, is changing what lives there and what they eat. "Think of it as looking at a forest and over a period of about a decade, all the species have changed," says Glibert, at Maryland. "The type of algae that grows at the base of the food web set the trajectory for what's growing at the top of the food web." After toxic algae was believed to have helped kill dozens of fin and humpback whales in the Gulf of Alaska in 2015, scientists raced to respond to other whale strandings, including this orca, which washed up dead near Petersburg, Alaska, in October. An investigation later showed it likely died of natural causes. Goes fears these changes ultimately could spell disaster for that region's fisheries, which provide tens of millions of dollars and help support life for 120 million people. Thus far, the creatures that most seem to like to eat this algae are jellyfish and sea-centipede-like creatures known as salps. Those, in turn, are eaten by animals that can thrive in low-oxygen environments, namely sea turtles and squid. Landings of squid already are on the rise in places like Oman, Goes says, while tuna and grouper catches are down. And the low-oxygen environment itself can have acute effects. Just last fall, low-oxygen water along the coast of Oman killed fish for hundreds of kilometers. Still, it's not always obvious what the trends really show or how all these pieces fit together. Charles Trick, with the University of Western Ontario, says the physics of ocean environments are so complicated that climate change is likely to worsen algal blooms in a select few places, but not necessarily as a general rule. He is skeptical about climate impacts on blooms in the Arabian Sea, for example, but believes environments like the U.S.
West Coast are prime for more massive blooms. "Everything in this field is controversial," Trick says. "There's a lot of enthusiasm to challenge the big questions, but not a lot of data." What information there is often isn't so clear. Kathi Lefebvre, with the National Oceanic and Atmospheric Administration's Northwest Fisheries Science Center in Seattle, has been the one tracking the domoic acid in hundreds of marine mammals in Alaska. The discovery in walrus, bowhead, and other Arctic mammals was a surprise, but it's not clear if it's part of a new trend—or simply the way things have always been. No one had ever checked before, so there is no past for Lefebvre to compare to. "It's a weird thing—we saw domoic acid in every species we looked at, so they are all being exposed to it," she says. But domoic acid in high doses sometimes leads to seizure and death, which had never been documented in the Arctic. Has it happened all along, but the region is so sparsely populated that no one noticed? Or are these blooms moving north and still building, potentially responding to warming waters and melting ice? "It's pretty clear that if you change temperature, light availability and nutrients, that can absolutely change an ecosystem," Lefebvre says. "But is it just starting? Is it getting worse? Is it the same as always? I have no idea." NPR : Poisonous Algae Blooms Threaten People, Ecosystems Across U.S.
Compilation of the Biggest waves ever surfed at Nazare Portugal. The waves at Praia do Norte, Nazaré, are famed for being among the largest in the world. It is a sport famed for the laid back attitude of those who take part, but now surfing is being revolutionised by technology in space. The world's leading surfers are turning to science to help them find the new surfing spots and identify the perfect conditions for catching the ultimate prize in their sport - big waves. Surfing has taken on new levels of competitiveness in recent years as surfers have sought out some of the biggest waves on the planet in an attempt to ride them. The world record is held by Garrett McNamara, who surfed a 78 feet tall wave at surfing hotspot Nazare, 80 miles north of Lisbon in Portugal. Yet finding such towering walls of water is becoming increasingly challenging as surfers try to find new areas that might offer waves that are even bigger. 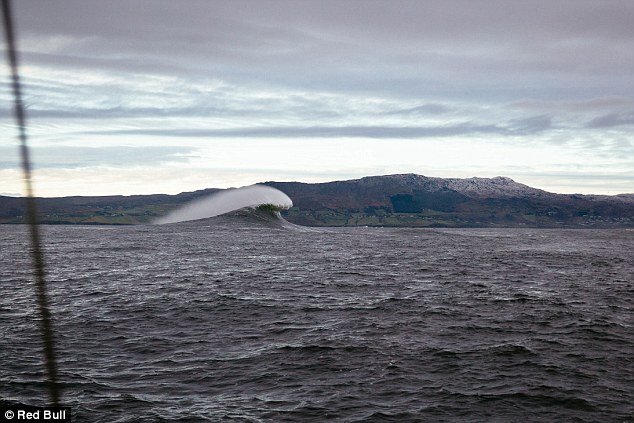 But Andrew Cotton, a 36-year-old plumber from Devon, believes he has found an entirely new area on the coast of Ireland that has the potential to produce some of the biggest waves on the planet. With the help of satellite technology, oceanographers and weather experts, he was able to identify a previously unknown surfing spot and unravel the conditions needed to get the best waves. His journey to surf this giant wave in October 2014 is revealed in a new film by Red Bull called Beneath the Surface. Mr Cotton said: 'Considering Ireland had such a bad winter, we probably saw the biggest waves in Ireland and Britain for the year. 'The exciting thing for me and any surfer, is that it is not just sheer size but the quality. 'Ireland is quite a unique place. Although it is quite popular with big wave surfers, it is really hard to score good waves. The weather is so hard to predict. 'My dream and my passion is to surf big waves, if not the biggest waves in the world. This new wave in Ireland has that potential. Mr Cotton estimates he managed to surf waves around 30 feet tall at the site, which he is not revealing the exact location of, but thinks it may produce waves of at least 60 feet in the right conditions - the equivalent of four double-decker buses stacked on top of each other. Big wave surfing requires the right combination of location and weather conditions. He first spotted the location of the wave from nearby headlands and had been captivated by the white caps he could see on the swell in the bay. 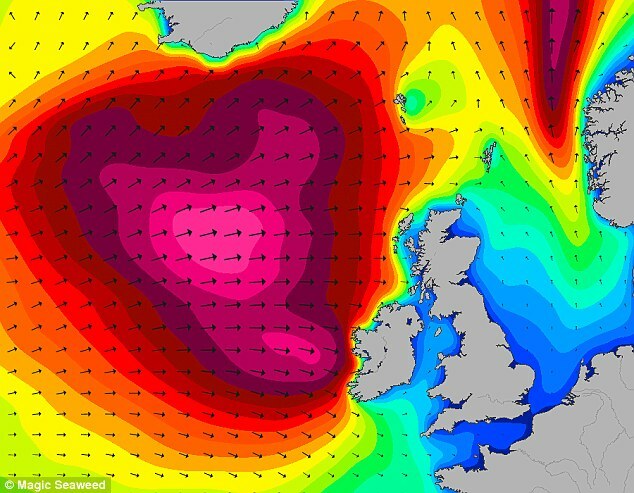 To work out whether the area might be able to produce big waves though, Mr Cotton turned to Ben Freeston from surf-forecasting company Magic Seaweed. Waves are created by the wind blowing across the surface of the water, creating friction and building up the size of the swell. What determines the size of a wave is the strength of the wind, how long the wind has been blowing for and the distance over which the wind has been blowing over the ocean, known as the fetch. Mr Freeston said: 'The biggest waves come from the strongest winds, blowing for the longest time over the largest stretch of ocean. 'There are some specifics, you need a large unbroken stretch of ocean, but the storms themselves tend to form in bands of latitude about 40 degrees north and the roaring 40s in the south. It just so happens that the west coast of Ireland sits perfectly in this band where the wind roars across the Atlantic, whipping up the swell to huge heights. 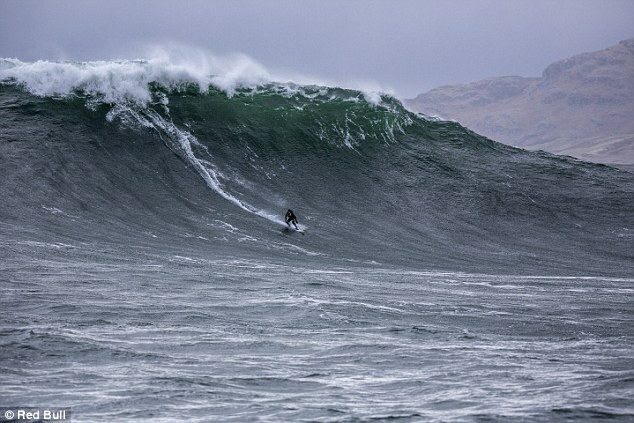 Mullaghmore Head is one of the most famous big wave spots in Ireland, and has seen people surfing waves up to 49 feet in height in stormy weather. The right combination of rocks and depth is important for big waves to form. Big wave spots tend to have deep water channels that run up to the coast and are fringed with reefs or rocks on either side. Underwater mapping helps Mr Freeston work out how the potential for waves along a given bit of coastline and can also help to predict the shape of the wave when it breaks. Nautical charts and historical charts of the coastline can also help to provide some clues about what may lie beneath the waves. Using satellite data going back nearly 35 years, Mr Freeston and his colleagues are able to reconstruct the ocean conditions almost anywhere in the world. They can calculate the wave heights from this at any given hour and then compare this to the weather conditions at the time. This means it becomes possible to accurately identify the exact criteria for when big waves will be possible. Mr Cotton said: 'Very quickly we were able to work out that this place gets its best waves when the swell comes from a certain direction. If it varies slightly to the north or south, it is half the size. 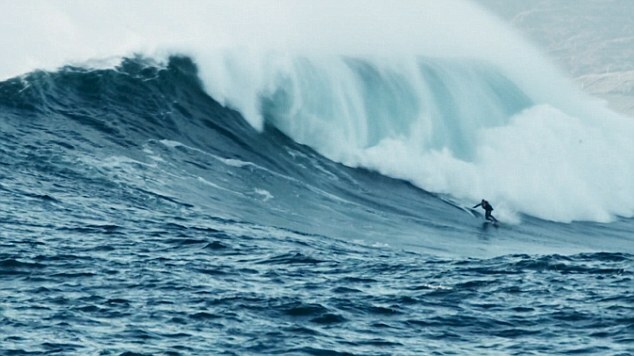 'It took four years to work that out for Nazare. We have come a long way in being able to work out the conditions for big waves. Big waves generally occur when storms sweep across the ocean. 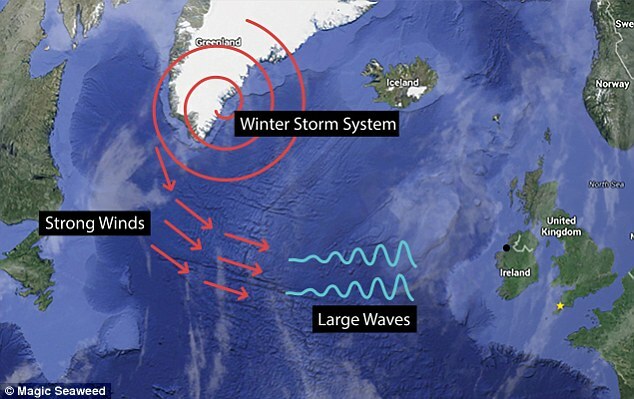 In Ireland this can mean the autumn and winter as the tip jet phenomenon in the Labrador sea around the south of Greenland can send powerful swells across the Atlantic. 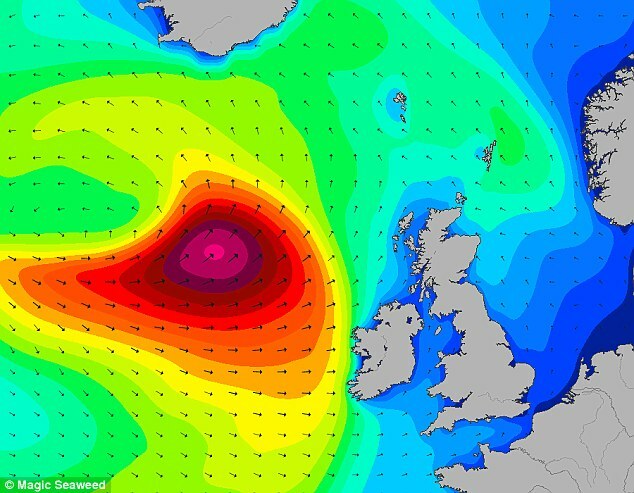 This year the swell coming across the Ireland was abnormally poor. Mr Freeston believes this may have been largely due to El Nino altering the weather patterns. The waves that Mr Cotton rode at his new spot appeared in relatively light wind conditions. But looking at his data from previous years, he believes the spot Mr Cotton has identified could produce some huge waves. Mr Freeston added: 'It was an abnormally poor year this year. Given the size of the waves he did surf, the potential for the future is pretty enormous. However, surfers also need to remain safe, so finding these big waves does not just require storms that sweep across the ocean, but gaps in the wind that bring large swell but light winds. The seafloor of Unalaska Bay is being mapped for the first time since 1935, and the technology's more thorough now, using electronic devices instead of a couple of people in a rowboat dropping a weighted rope to the bottom a hundred feet apart. The National Oceanic and Atmospheric Administration is conducting the hydrographic survey, using four 28-foot-long aluminum boats to map 38 square underwater miles, according to NOAA Lt. Bart Buesseler. The new information aims to update nautical charts, in hopes of preventing another mishap like last summer's incident involving Shell's offshore oil support ship Fennica, which hit a high point underwater not identified on a chart between the Unalaska Airport and Hog Island. The old-school method of measuring depths always left gaps, missing high or low points in between the manual depth measurements. Still, Buesseler said it wasn't as though the boat operators had no warning at all, as the chart indicated shallow water with blue tint shading. The survey's small boats arrived on the federal research ship Fairweather, for a job that should take nine people 20 days to finish. The 231-foot Ketchikan-based Fairweather is now off on another project, and will pick up the 28-footers when it returns. Only two of the four small boats are in use at one time, while the other two remain in port, he said. Buesseler gave a report on the project at last week's Aleutian Life Forum, a science conference at the Grand Aleutian Hotel which is also the hydrographers' local base of operations. According to a statement from NOAA last year, the MSV Fennica, a Finnish multipurpose icebreaker, operating in support of Royal Dutch Shell's Arctic oil exploration efforts, reported striking an obstruction in the vicinity of a charted shoal between Hog Island and Amaknak Island near Dutch Harbor on July 3, 2015. NOAA Ship Fairweather, while in Dutch Harbor for a scheduled port call, was contacted by a representative from the Alaska Marine Pilots to survey the area following the incident. Preliminary data collected by the Fairweather shows that there are certain rocky areas shallower than five fathoms (30 feet), and one as shallow as 3.75 fathoms (22.5 feet). These were not detected by the last survey of the area conducted in 1935. No objects or obstructions such as anchors or debris were detected in the preliminary results. 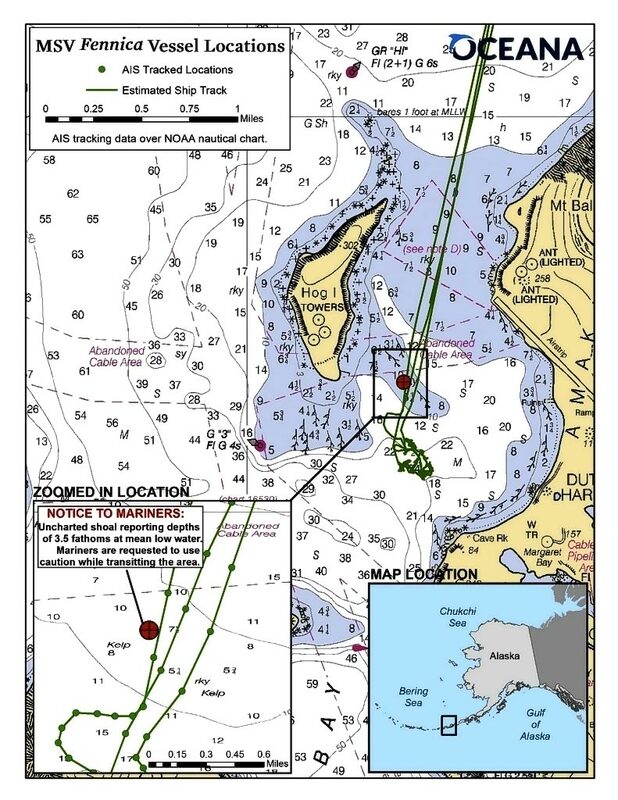 NOAA has submitted a Dangers to Navigation Report to the U.S. Coast Guard that identifies the shoal depths in the area. Less than 1 percent of U.S. Arctic waters have been surveyed with modern survey methods. Modern survey methods use vessel-mounted multibeam echo-sounders to measure ocean depths, and GPS for precise positioning, as the ship or boat moves along a planned track. Many charts in the U.S. Arctic, including Western Alaska and the Aleutians, still have depth information from pre-WWII surveys, which relied on hand-lead lines or wire sounding machines for measuring depths, and sextants for positioning. ASV Global and TerraSond have completed a 5172 nautical mile hydrographic survey in the Bering Sea, off Alaska. TerraSond used the C-Worker 5 Autonomous Surface Vehicle (ASV) alongside its Q105 survey vessel for a duration of 36 days. The C-Worker 5 completed 2275 nautical miles of survey lines operating as a force multiplier, running parallel survey lines to the Q105. Both vessels ran multibeam sonars and simultaneously towed side scan sonars. 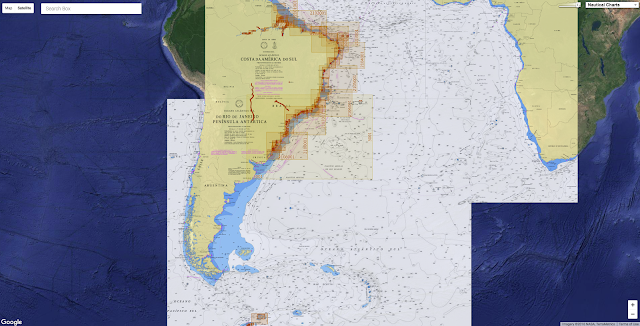 This 2016 deployment was a follow on from a proof of concept operation carried out between TerraSond and ASV Global in August 2015 during which an ASV platform became the first autonomous surface vessel to update the US nautical charts for NOAA. In anticipation of growing vessel traffic in the Arctic, NOAA is increasing its charting activities in the region to help ensure navigation safety. NOAA ships Rainier and Fairweather are conducting a summer of hydrographic surveying projects in the U.S. Arctic along the western coast of Alaska, including Kotzebue Sound, Port Clarence and Point Hope. 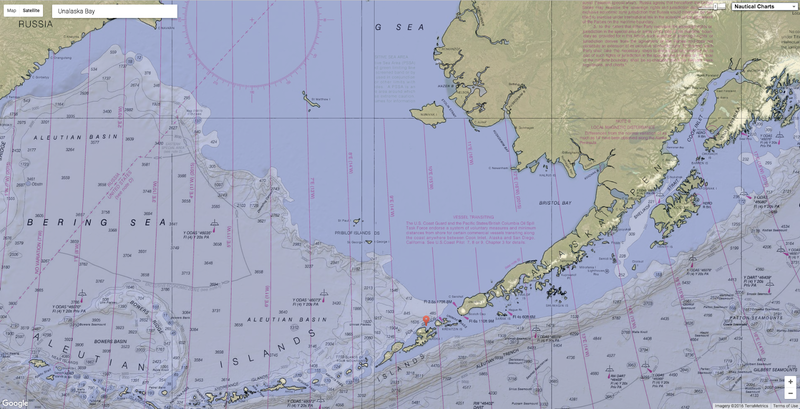 Reconnaissance bathymetry is also being collected along the main shipping route, which extends from the Aleutians up through the Bering Strait as a joint effort with the USCG Cutter Healy. 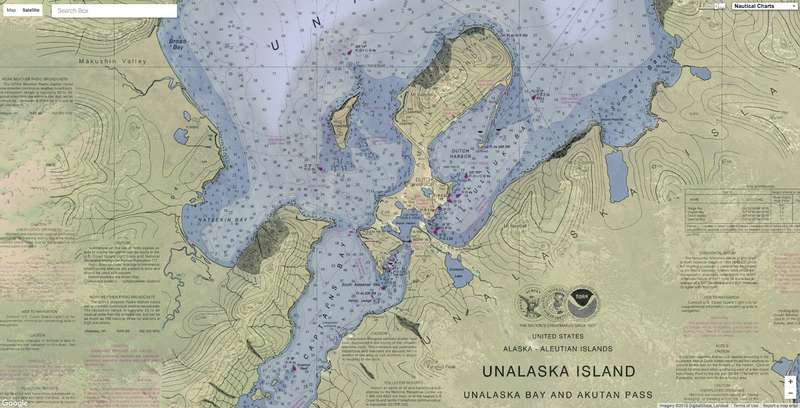 NOAA will use these hydrographic surveys, which measure ocean depths and search for dangers to navigation, to update nautical charts for Alaska's waters. The Papahanaumokuakea Marine National Monument is set to become the largest ecological preserve in the world. A graphic from The Pew Charitable Trusts puts that size in perspective — the area will be more than 3.5 times the size of California, 10 times the size of Iowa and 105 times the size of Connecticut. President Obama on Friday created the largest ecologically protected area on the planet when he expanded a national marine monument in his native Hawaii to encompass more than half a million square miles. The president more than quadrupled the size of the Papahanaumokuakea (pronounced “Papa-ha-now-moh-koo-ah-kay-ah”) Marine National Monument to 582,578 square miles of land and sea in the Northwestern Hawaiian Islands. Bush established the monument a decade ago, but Obama’s action Friday underscores the high priority he has placed on issues of conservation and climate change in his second term. The president has now used his executive authority under the 1906 Antiquities Act to protect more than 548 million acres of federal land and water, more than double the set-asides of any of his predecessors. Many scientists, environmentalists and Native Hawaiians have argued for more stringent protections for the biologically rich region, given important deep-water discoveries in the area and the dual threats of climate change and sea-bed mining. “The oceans are the untold story when it comes to climate change, and we have to feel a sense of urgency when it comes to protecting the ocean that sustains us,” said Sen.
Brian Schatz (D-Hawaii), who helped broker a compromise with groups including Native Hawaiians and day-boat fishermen. 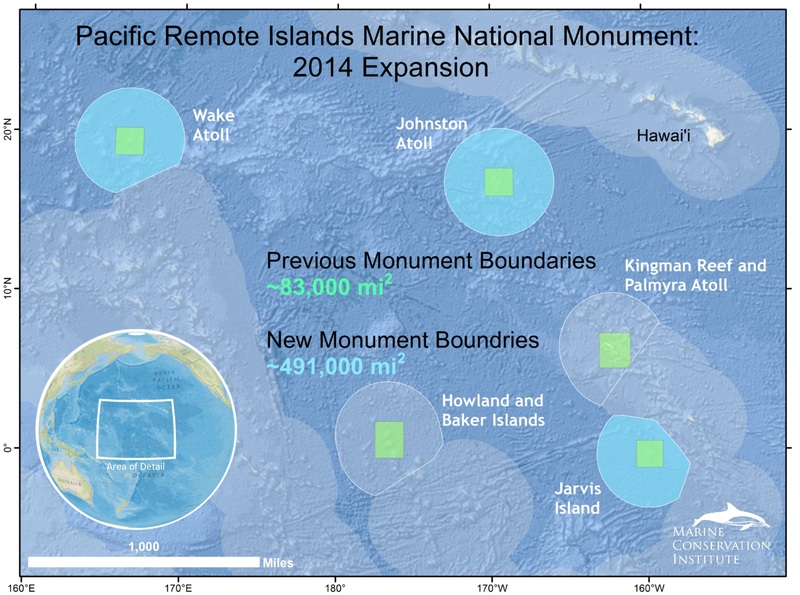 The expansion of Papahānaumokuākea Marine National Monument, surrounding the Northwestern Hawaiian Islands, is one of the largest conservation actions in history. The monument is now the largest protected area in the world—almost four times as large as California—measuring a total of 582,578 square miles. Papahānaumokuākea also happens to be one of the most biologically and culturally significant places on the planet. The expansion not only creates a safe zone for the replenishment of tuna stocks and promotes biodiversity—it gives Native Hawaiians a greater voice in managing this precious resource. All commercial extraction activities, including fishing and future deep-sea mining, will be prohibited in the expanded monument area. However, recreational fishing, removal of resources for traditional Hawaiian cultural purposes and scientific research will be allowed with a federal permit. Obama will highlight his action in an address Wednesday to the Pacific Islands Conference of Leaders and the IUCN World Conservation Congress in Honolulu, and will travel the following day to Midway Atoll, which is located within the current monument. The president has unilaterally established more than two dozen national monuments, most of them in his second term. Longline fishermen lobbied against any new protections, arguing that their industry rejects damaging practices such as trawling and needs flexibility to sustain an annual catch valued at more than $100 million. “We move all over the ocean, in the way the fish move,” said Jim Cook, co-owner of POP Fishing and Marine, a Hono­lulu store, adding that the new restrictions mean 60 percent of federal waters off Hawaii are now closed to fishing. With Friday’s action, seven presidents — starting with Theodore Roosevelt in 1909 — have taken steps to safeguard parts of the archipelago, which is one of the most biologically diverse areas in the world. It is the planet’s largest seabird gathering site, with more than 14 million birds from 22 species, and is home to nearly all Laysan albatrosses and the remaining endangered Hawaiian monk seals. 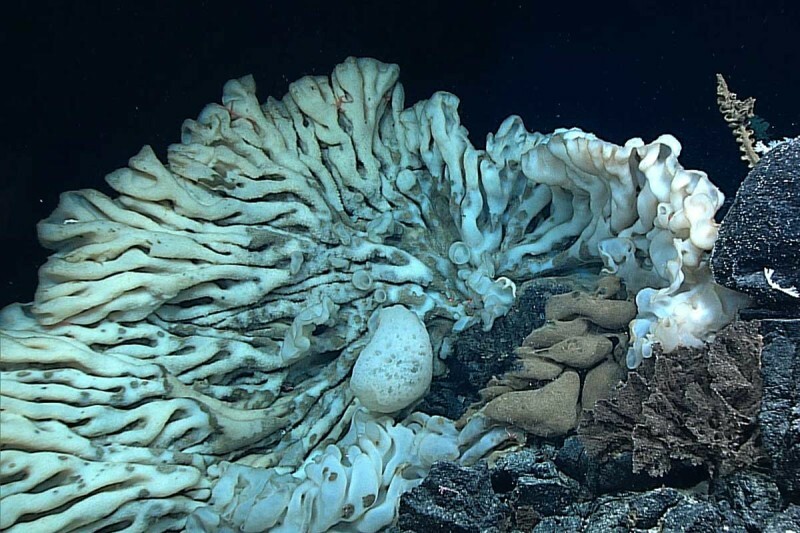 Recent research expeditions have unearthed extraordinary features beyond the existing monument boundaries, such as the world’s oldest living animal — a black coral estimated to be 4,500 years old — and six massive seamounts, one of which is nearly 14,000 feet high and teeming with life. This area also includes the wreckage of the USS Yorktown, which sank during the Battle of Midway in 1942 and has not been visited since it was discovered there in 1998. “We’re seeing a lot of life, a lot of new life and a lot of very old life,” he said. Wagner said he is particularly concerned about future underwater mineral extraction, given the rich deposits of manganese, nickel, zinc, cobalt and titanium in the region. “If they’re not protected, they’re going to be exposed to mining,” he said. Schatz suggested a change to the proposal that carved out areas where day-boat fishermen in Kauai and Niihau can continue operating. His suggestion won the support of influential state officials such as Democratic state Sen.
Kouchi said in an interview that he could back Obama’s expansion as long as it is the last one. 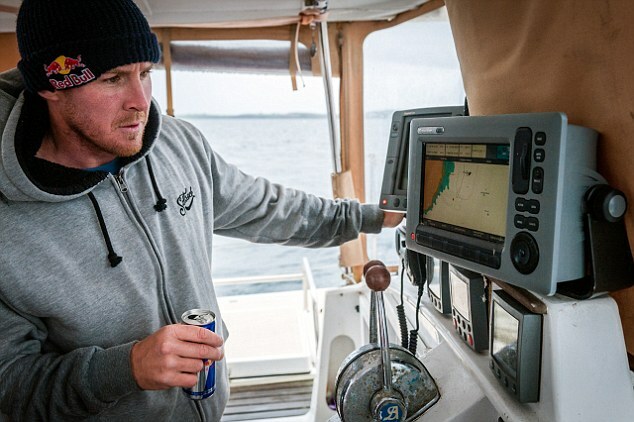 “One of the questions the fishermen are asking is, ‘When will it stop?’ ” he said. Federal officials estimate that 5 percent of current commercial fishing efforts will be displaced. Longline operators already catch about half their fish in international waters, and they reached their annual catch limit for big-eye tuna in early August. However, Sean Martin, president of the Hawaii Longline Association, said the industry’s fleet of 145 boats could not match the lobbying power of well-financed environmental groups such as Pew. “We’re obviously going up against environmental organizations that have billions of dollars,” Martin said. “For somebody to feel good, we’re going to force U.S. But Richard Pyle, a researcher at Hawaii’s Bishop Museum, said he and other scientists have concluded that the ecological interconnectedess of the region — including the fish larvae that are dispersed on currents, and the sharks and other pelagic fish that travel vast distances — extends beyond federal waters. “The minimum space necessary for protection, it’s more about 350 to 380 miles, but of course we don’t have the jurisdiction for doing so,” Pyle said. Some Native Hawaiian activists, moreover, lobbied for greater protection so they could continue to observe traditional voyaging practices in which they navigate without instruments. The state Department of Land and Natural Resources and the Office of Hawaiian Affairs will serve as trustees in managing the monument. Asked what he thought of the monument expansion, Aila switched to Hawaiian. Most people have no idea of the connection between how they manage their lawn and gardens at home and the health of our local waterways and beaches. From unnecessarily treating our garden and lawns with chemical fertilizers and pesticides to applying too much water, we’re killing all the beneficial biology in our soils that support beautiful and healthy plants, and it’s creating polluted runoff. Landscaping chemicals don’t stay where they are applied, but instead can leach into groundwater or be washed away by runoff when it rains or when misdirected irrigation runs off our properties. The resulting storm water and urban runoff pollutes local waterways and harms coastal ecosystems by causing harmful algal blooms and killing fish and other aquatic animals. Water affected by runoff makes it dangerous to swim and play in. Ocean Friendly Gardens act like a sponge in your landscape. These gardens are shaped in a natural way to capture rain and runoff, contain native, climate appropriate plants and healthy, living soil which soaks up, stores and filters out pollutants from stormwater and road runoff. They have the added bonus of providing native habitat for bees, birds and butterflies. And it’s an important tool in addressing climate change as healthy plants and soil work in combination to capture and store carbon from the atmosphere. In the most basic terms, Ocean Friendly Gardens can conserve water, help clean up local waterways, and be beautiful and affordable too. Healthy beaches start upstream with clean rivers, lakes and streams. Whether you live inland or by the coast, we can all do our part to protect local waterways and our ocean from being polluted. Looking for more ways to learn more and help support the Surfrider Foundation's efforts to protect our ocean, waves and beaches? Learn more about our Eastern Long Island Chapter featured in Into the Sea. Support our clean water work to make sure a day at the beach or local waterway won't make you sick! Find a chapter near you to join in and help protect our ocean, waves and beaches.